In the late 1990´s and early 2000´s, floating themselves on the stock market in order to raise capital seemed to be the preferred move for many football clubs, especially in the UK. Today only 22 clubs are listed on European stock exchanges and tracked in the Stoxx Europe Football, the main index for European clubs. The general euphoria around football clubs IPOs seems to have tapered off. 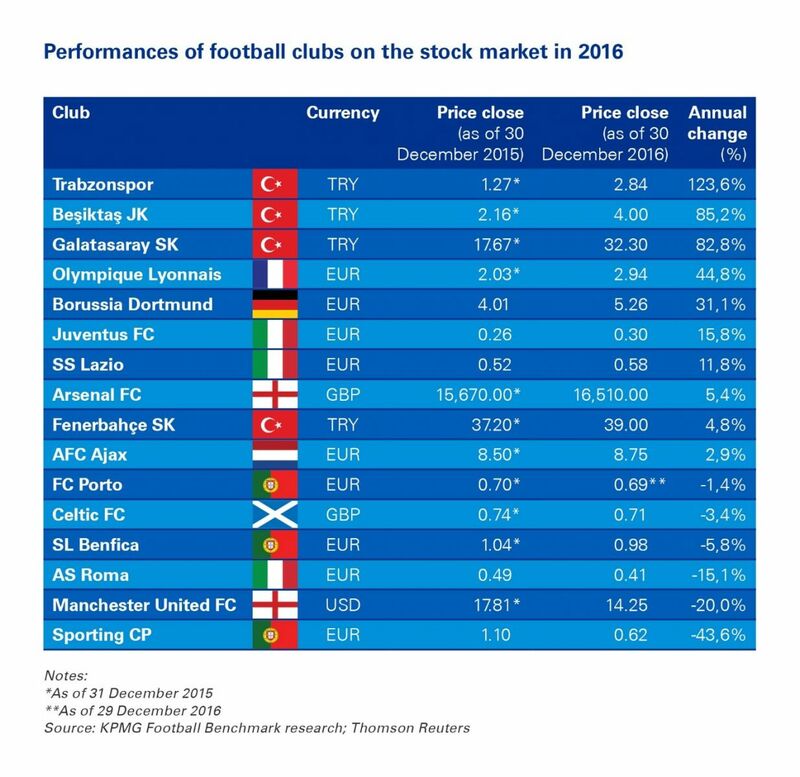 In this article, KPMG´s Football Benchmark team analyses the stock market performance of listed football clubs from seven countries (France, Germany, Italy, the Netherlands, Portugal, Turkey and the UK) for the 2016 calendar year. As shown in the following table, in 2016 listed football clubs recorded mixed results on the stock exchange, inspiring us to further analyse the situation. In a few cases, the clubs’ on-pitch performances were mirrored by their share price. As an example, Juventus FC won their fifth consecutive Serie A title but also saw their stock market performance improve by 15.8%. At the other end, Manchester United, despite posting impressive revenue results, failed to qualify for the 2016/17 UEFA Champions League and experienced a 20% decrease in their share price. However, SL Benfica were a good example of how there can be a lack of correlation between the on-pitch and stock market performance of a club. Indeed, despite increasing their operating revenue by 24%, winning the 2015/16 domestic title and performing well on the international stage, the Portuguese club’s share price actually fell by 5.8%. Interestingly, three Turkish clubs – Beşiktaş JK, Galatasaray SK and Trabzonspor – experienced the highest growth in share prices. These clubs’ stock prices, although more volatile than their European counterparts, seemed to have been positively impacted by various non-sporting events such as new sponsorship agreements, development of new infrastructures and reforms in the league governance, all of which are seen to be factors increasing the commercial value of the Turkish top-division. The odd-one-out was Fenerbahçe SK, who were penalized by UEFA for breaching Financial Fair Play regulations in 2015/16, and who then saw only minimal share-price growth compared to their peers. Alongside the above, only the French and German league runners-up of 2015/16 experienced significant increases in share prices. Olympique Lyonnais’ share price was positively impacted by key events such as the minority stake acquisition by Chinese investment fund IDG, which resulted in a 7% price rise after the announcement, and the inauguration of the club’s new stadium, the only privately-owned venue in French Ligue 1. Similarly, Borussia Dortmund, who will benefit from the new lucrative broadcasting deal signed by the German Bundesliga starting in the 2017/18 season and which is one of the European clubs’ with the healthiest staff cost to revenue ratio, saw their share price increase by 31.1%. With a few exceptions, football clubs’ stock still remain stagnant and illiquid. However, as European clubs continue to grow into professionally managed global businesses, going public may be an increasingly viable consideration for various clubs. Further investigation into this and related topics, as well as analysis of industry data, can be undertaken for you by KPMG Sports Advisory Practice. Our subject matter experts can also assist stakeholders in assessing and interpreting the potential impact on their organizations of any particular piece of research, identifying the underlying reasons behind specific trends or developing potential solutions and considering future scenarios. This piece was first published on KPMG Football Benchmark and has been republished with the permission of the author. The original is available to view here. Andrea is the Global Head of Sports, and the Head of Real Estate, Leisure and Tourism in Central & Eastern Europe. Andrea is a Partner at the Hungarian firm in Budapest, having begun his career at KPMG in South Africa in 1994, in Cape Town. For the past 20 years, he has been an active participant and initiator in the lifestyle real estate, sport, leisure and tourism industries, and performing engagements in more than 35 countries.